The mailman is a liar and so is the lady down at the post office with the hole in her throat. They both say that they can’t send mail to where you are but I know there’s a way. Mom’s still coughing all the time, and Dad spends all his time looking out the window. When I ask him what he’s looking at, he gets all startled like he forgot where he was. I spend a lot of time on the roof so I don’t bother Dad. Remember the roof, Ro? Mom used to take us there on warm nights to see the all the city lights glitter at the edge of the sky and blend in with the stars and the satellites. She used to tell us what a pity it was we couldn’t see more stars. “Light pollution,” she would say, but I always thought it was spectacular. I always think of the last night we were there together and you held my hand, squeezed it real tight. It was like you knew. It was like you knew that it was all going to end. Someone is finally moving into apartment 6B. He’s tall and black and has a big scratchy-looking beard. His mailbox says “Okafor.” I wonder if that’s his first name or last name. I know it’s been a year since you left but I still really miss you. I hope that this letter gets to you. Mom told me not to bother the man in apartment 6B but I had to. Okafor is his last name. His first name is Simon and he talks with an accent. He let me help him move in. When I was carrying his stuff, I found a box in the closet. I know we must have played there a million billion times but I had never seen it before. I opened it up and dust plumed out of it. When I brushed it away, the box was full of dark mechanical parts. I brought the box to Mr. Okafor. He kneeled down and inspected it, furrowing his brow. He sorted through it, leaving each separate part lying side by side on the stained hardwood floor, his hands coated with ancient dust. When he found a case with little glass circles in it, he smiled. “It’s a telescope,” he said. I like when he smiles. It makes me feel sure of something. Sure that the floor is staying under my feet. But you know me. I’m no good at little parts. I don’t think I can build the telescope with him. I hope he won’t be too disappointed. Have you been taking your medicine? You know you have to. I know the rules. Wishes are no good to make unless you throw a coin into a well, see a shooting star or blow out your birthday candles when you make them. We used to wish all the time, remember? We couldn’t make our own shooting stars and our birthday only came once a year, so we would close the sink drain, fill it up with water and toss coins in, wishing that we could make the fireplace work, that Dad would win the lottery, that Mom would get better. And later we wished that things would change even though we knew they couldn’t. I can’t sleep when Dad spends the night on the couch because he snores so loudly. I wish Mom would stop kicking him out of their room. She says it’s so she doesn’t keep him up with her coughing but I know she’s lying. And I wish she would stop. I’m not stupid. Dad said the water bill is too high for me to waste any wishing. I told him that it’s not a waste and maybe if I wished for more money we could pay the water bill, and he sighed and kept looking out the window at nothing. I hope you remember. I know it’s been a long time since I’ve seen you but I’ll be mad if you forgot. Mr. Okafor found me today while I was drawing in the hall. He invited me back to apartment 6B to help him with the telescope. I was too shy to say no. He explained how it worked, with the lenses and the refraction and something called a convex, and we started building and didn’t stop until it got dark. It felt good to make something with my hands. It made me forget that you left, for a little while at least. When I came back to the apartment, I startled Dad sleeping on the couch. What if our souls had colors? Mr. Okafor’s would be grey, like cigarette smoke, like the tips of his hair. Dad’s would be a sparkling turquoise like the ocean is on Cape Cod in the summer, and Mom’s would be golden-yellow like the finches that nest in the oak tree outside of our bedroom window. What color would our soul be? I think it would be bright orange, the color of feelings, the color of fire. A color that can create and destroy. Mr. Okafor told me I have an old soul. When I told him that my soul is eight and three quarters, just like the rest of me, he chuckled. I don’t know why it was funny but I like that I made him laugh. I haven’t made someone laugh since you left. I asked Mr. Okafor where he was from while we sorted telescope parts. I know Mom and Dad would say that’s a rude question but I felt like being honest instead of polite today. He said he moved here from Nigeria and he laughed again when I told him Nigeria sounded a lot cooler than Arlington. I told him how Dad’s family came from Ireland and Mom’s family came from Italy. “But where are you from?” he asked again. “You ask a lot of questions,” I said. “You laugh a lot, Mr. Okafor,” I said. And he said yes, and we went on. Our telescope is beginning to look like a telescope. I wish you could come back meet Mr. Okafor. Even though I know you won’t. I would throw a coin in the sink for you, but the water bill and all that. Sorry this is written on a gum wrapper. No more paper. Take your medicine. What if our eyes shed light? We would never need light bulbs again, and the electric bill would be cheaper. We would cry bioluminescent tears and on clear nights, we wouldn’t be able to see any stars because of the light pollution from all the stargazers. Today was not so great. Mom and Dad were fighting the whole time, and at the end of the day Mom told Dad to leave. If tears were light, our apartment would look like the sun from the street, bright rays of sorrow shining through the window and illuminating the whole neighborhood. I did everything I could, Ro. I begged Mom to stop. I begged Dad to stay. As we put together the telescope’s aperture, I told Mr. Okafor that I wanted to run away. “Then why don’t you?” Mr. Okafor asked. I guess he’s right, but it doesn’t feel like I can do whatever I want. I feel like I’m in a car that’s about to drive off a cliff and my seatbelt is stuck. Sorry about my handwriting. Dad didn’t pay the electric bill and I’m writing in the dark. It’s me, Alex. How could you do this to us? We were always Ronan and Alex, remember? Never just Ronan or just Alex. We were the boys, the twins, Alex-and-Ronan, Ronan-and-Alex, Ro-and-Al. Do you remember the way Mom said it all in one breath like ‘Ro-n-al’? We shared a breath, Ro. We shared an existence and I hate you for taking half of it away. I hate how you left everything behind. It’s been a year but I still can’t look at your side of the room without crying. Nobody’s made your bed since you left, you know that? There’s still a Ronan-shaped dent in the blankets. And there are still four chairs at the kitchen table. I hate you for dying so slowly. You could have died all at once but you died little by little. I hate how your hair fell out and then you threw up all the time and got so skinny and weak, and Mom and Dad went broke from your medicine, and now that’s how I remember you. I hate you because the parts of you that were more than cancer get farther away every day. I hate you for dying at all. You ruined Mom and Dad. You ruined me. You turned me into somebody who writes letters to nobody, folds them into paper airplanes and throws them to the sky from the rooftop. You are nothing but a broken promise. When you receive the letter I sent you yesterday please throw it away. If you already read it, I’m sorry I was mean. I just wanted to be your friend for a little longer. I miss you. Wherever you are, I know you probably miss me too. Dad moved the last of his stuff out yesterday. It could have gone worse, I guess. There was no screaming or throwing. The sound of his suitcase rolling across the floor woke me early that morning. When I got out of bed, he was gone. Whatever he was looking for out the window, I hope he finds it. I went to see Mr. Okafor last night and we finished building the telescope. When the last piece snapped into place with a click, I jumped up and hugged him. I didn’t mean to, but I was so happy. It had just been a pile of parts, and we had turned it into something. Something permanent. Something that worked. So we took it to the rooftop and tried to see the universe. “Can you see?” Mr. Okafor asked. And there it was. The stars, the satellites, and the distant city all blending together. I know you’re somewhere up there. I know that one day you’ll find one of my paper airplanes and write back. I’ll keep writing you until then, I promise. I’ll keep writing you and looking for you with the telescope and you’ll keep taking your medicine. Deal? How do the stars look from behind, Ro? Are they as bright on the other side? Sam Wachman is a writer and cat enthusiast from Cambridge, Massachusetts. In 2018, he was one of eight young writers to win a Gold Medal Portfolio at the Scholastic Art and Writing Awards. 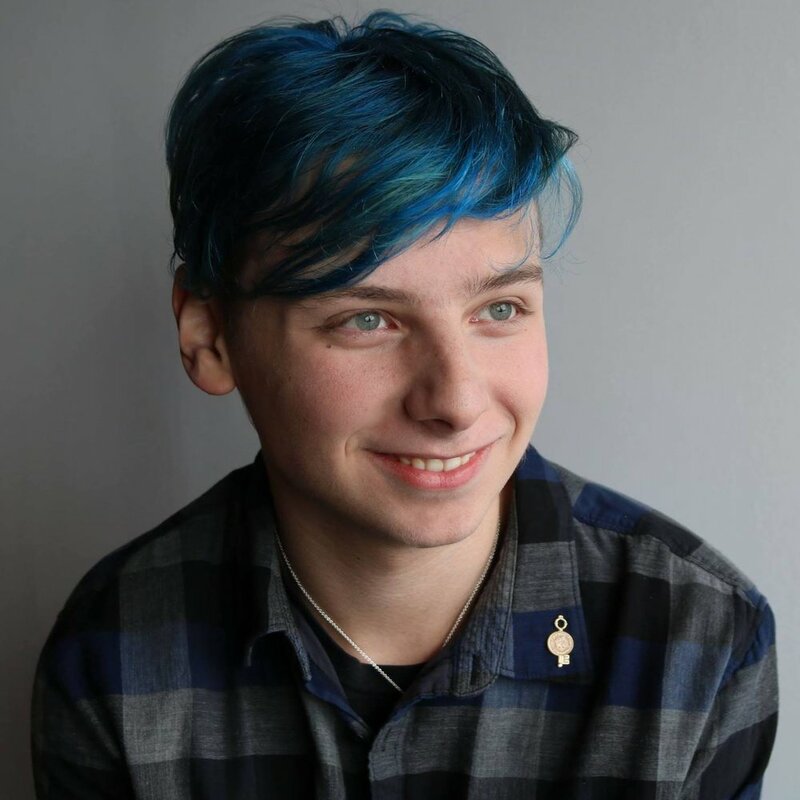 His writing has appeared in The Best Teen Writing of 2018. He is a freshman at Brandeis University.